An independent Scotland would be able to get rich on renewable energy sector revenues, First Minister Alex Salmond, pictured in January 2012, insisted Wednesday. 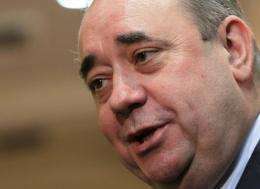 An independent Scotland would be able to get rich on renewable energy sector revenues, First Minister Alex Salmond insisted Wednesday. Scotland could harness the power of wind, waves and the tides, bank the profits from exports and make money on the interest, Salmond said in a speech at the London School of Economics university. British Prime Minister David Cameron is heading to Edinburgh on Thursday for his first talks with Salmond about an independence referendum, which the first minister wants to hold in late 2014. "Under independence we would make the best use of our unparalleled energy resources," Salmond said. "We have 25 percent of Europe's tidal power potential, 25 percent of its offshore wind potential and 10 percent of its wave power potential -- not bad for a nation with less than one percent of Europe's population. "Scotland has a huge competitive advantage. We will be able to produce energy better and cheaper than anywhere else -- and in deeper waters." Salmond said developing the renewable energy sector could reindustrialise the country, while there was still another 40 years' worth of oil and gas reserves under the North Sea. He cited research by thinktank Reform Scotland that suggested an independent Scotland could export half the electricity generated by 2020 if it met the Scottish government's renewable energy targets, increasing the country's exports by £2 billion (2.4 billion euros, $3.14 billion) per year. Salmond said he wanted to create a sovereign wealth fund from the profits. "The rest of the UK has much to gain from the emergence of a secure, prosperous ally to its north," he said. Salmond has pushed for a referendum since his Scottish National Party last year won the first majority in the Edinburgh parliament since the Scottish assembly was formed in 1999.